Merrie Melodies is an American animated cartoon series of comedy short films produced by Warner Bros. from 1931 to 1969, during the golden age of American animation. As with its sister series, Looney Tunes, it featured cartoon characters such as Bugs Bunny, Daffy Duck, Porky Pig and Elmer Fudd. 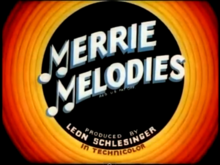 The classic Merrie Melodies title card from the 1937–38 season. Merrie Melodies was originally produced by Harman-Ising Pictures from 1931 to 1933, and then Leon Schlesinger Productions from 1933 to 1944. Schlesinger sold his studio to Warner Bros. in 1944, and the newly renamed Warner Bros. Cartoons continued production until 1963. It was outsourced to DePatie–Freleng Enterprises and Format Productions from 1964 to 1967, and Warner Bros.-Seven Arts Animation resumed production for its final two years. Three of the Merrie Melodies films (Tweetie Pie, Speedy Gonzales and Birds Anonymous) won the Academy Award for Best Animated Short Film and another three (Duck Amuck, One Froggy Evening and What's Opera, Doc?) have been inducted into the National Film Registry of the Library of Congress. In 2013, TV Guide ranked the Warner Bros. Cartoons (ranked as Looney Tunes) the third Greatest Cartoon of All Time (out of 60), one of only three film series to make the list (the other two being the Pink Panther series and Tom and Jerry). Producer Leon Schlesinger had already produced one cartoon in the Looney Tunes series, based on music, and its success prompted him to try to sell a sister series to Warner Bros. His selling point was that the new cartoons would feature music from the soundtracks of Warner Bros. films and would thus serve as advertisements for Warner Bros. recordings and sheet music. The studio agreed, and Schlesinger dubbed the series Merrie Melodies. Walt Disney Productions had already scored with their Silly Symphonies. Since cartoon production usually began with a soundtrack, animating a piece of music made it easier to devise plot elements and even characters. The origins of the Merrie Melodies series begin with the failure of a live action series of musical shorts called Spooney Melodies, which featured popular songs of the day. These shorts included segments with a popular artist singing along with appropriate background sequences. Warner Bros. wanted to promote this music because they had recently acquired (in 1930) the ownership of Brunswick Records along with four music publishers for US $28 million. Because of the success of their Looney Tunes series, Warner Bros. decided to develop a new series of animated musical shorts called Merrie Melodies. Hugh Harman and Rudolf Ising led the development. It was meant to be a series of musical cartoons that featured hit songs of the day, especially those then owned by Warner Bros. and featured in their musical films. In 1931, many of the shorts featured the orchestra of Abe Lyman, one of the most famous band leaders of his day. The first cartoon of the new Merrie Melodies series was Lady, Play Your Mandolin!, released in 1931. Ising attempted to introduce several characters in his Merrie Melodies films, such as Piggy, Foxy, and Goopy Geer. Eventually however, the series continued without any recurring characters. The shorts proved to be enormously popular with the public. In 1932, a Merrie Melodies cartoon, entitled It's Got Me Again!, was nominated for the first Academy Award to be given for animation. When Harman and Ising left Warner Bros., in 1933, they took with them all rights to the characters they had created. Leon Schlesinger had to negotiate with them to keep the rights to the name Merrie Melodies, as well as for the right to use the slogan, So Long Folks, at the end of the cartoons. In 1934, Schlesinger produced his first color Merrie Melodies shorts, Honeymoon Hotel and Beauty and the Beast, which were produced in two-strip Cinecolor (Disney then had exclusive animation rights to the richer three-strip Technicolor process). Their success convinced Schlesinger to produce all future Merrie Melodies shorts in color, using two-strip Technicolor. Looney Tunes continued in black and white until 1943. In 1936, the cartoons began to end with the slogan "That's all Folks!" which had previously only been used on the Looney Tunes series. The old slogan "So Long, Folks!" was completely abandoned at this time. The same year, Merrie Melodies began using the bulls-eye opening and closing title sequences (in 1942, Looney Tunes would use the same titles, usually in thicker rings). Also by 1936, Disney's exclusivity on the three-color Technicolor process was lifted, allowing Merrie Melodies a full color palette for the first time, hence the use of the blue concentric rings (as a technical test) for the rest of the 1935–36 season and the 1936–37 season. The Warner Bros. shield was later that year changed to cyan before definitely changing back to red in 1938. Contractually, Merrie Melodies cartoons were obligated to include at least one full chorus from a Warner Bros. song. Warner Bros. requested that these songs be performed by name bands whenever possible, but this lasted only through the first few shorts. The policy annoyed the animators of Merrie Melodies, since the songs often interrupted the cartoons' momentum and pacing (the 1938 Merrie Melodie A Feud There Was, for example, sarcastically uses the obligatory musical number as a shift in the action, with the lead characters singing the number into a KFWB microphone and ceding the mike to an announcer who reads a commercial). By 1939, the animators had been released from this obligation, and the Merrie Melodies shorts came to resemble more closely the black-and-white Looney Tunes series. In addition, several new characters were created to (initially) appear exclusively in the Merrie Melodies series, such as Egghead (who became Elmer Fudd), Inki, Sniffles, and even Warner Bros.' most popular cartoon star, Bugs Bunny. In 1943, Schlesinger began producing Looney Tunes in color as well, and the two series became virtually indistinguishable except by their theme music and opening titles – in addition, characters once exclusive to one series began regularly appearing in the other as well. In 1944, the studio went to an all-color schedule; though for the first year of this, Bugs still appeared mainly in the Merrie Melodies series (not appearing in a Looney Tunes cartoon until the end of August), whereas Daffy Duck and Porky Pig (who each appeared in a few Merrie Melodies prior to mid-1942) appeared mainly in Looney Tunes that year. It was not until 1945 that the two series appeared completely indistinguishable, and that Bugs appeared in more Looney Tunes than Merrie Melodies. By 1937, the theme music for Looney Tunes was "The Merry-Go-Round Broke Down" by Cliff Friend and Dave Franklin and the theme music for Merrie Melodies was an adaptation of "Merrily We Roll Along" by Charles Tobias, Murray Mencher and Eddie Cantor (the original theme was "Get Happy" by Harold Arlen, played at a faster tempo). This continued until 1964, when the WB cartoon logos were modernized, and "The Merry-Go-Round Broke Down" became the theme for the Merrie Melodies as well. When the studio went to full color, even the animators themselves did not make any creative distinction between the two series, as evidenced in an interview quote from director Friz Freleng, "I never knew if a film I was making would be Looney Tunes or Merrie Melodies, and what the hell difference would it make, anyway?". The last Merrie Melodies cartoon was Injun Trouble released in 1969. The Merrie Melodies theatrical cartoons didn't start up again until 1988 with only two cartoons made, The Night of the Living Duck (1988) and (Blooper) Bunny (1991). The Night of the Living Duck got a theatrical release through the compilation film Daffy Duck's Quackbusters (1988), while (Blooper) Bunny was shelved from its intended 1991 release until it premiered on Cartoon Network on June 13, 1997. 1955–56 season rings with Blue Ribbon version of Merrie Melodies opening titles, taken from Kit for Cat, one of only five post-1948 era credit-less Blue Ribbon and the only that was originally a Looney Tunes short. Beginning in late 1943, WB, in a cost-conserving effort, began to reissue its backlog of color cartoons under a new program that they called Merrie Melodies "Blue Ribbon" classics. For the reissue, the original front-and-end title sequences were altered. The revised main title card began with the "zooming" WB logo, followed by the title logo set against a background featuring a "blue ribbon" (hence the re-release program's title) and a Grand Shorts Award trophy, followed by the name of the cartoon. This revised title sequence eliminated the opening technical credits. The ending title card was also revised (except for the 1943–44 season and half of the 1944–45 season of reissues, such as A Wild Hare and I Love to Singa when Schlesinger was still producing the cartoons and cartoons in the Merrie Melodies series originally released between September 1, 1944 and July 10, 1948), replacing the original versions. "A Feud There Was" was the first cartoon to be re-released with Blue Ribbon titles on September 11, 1943, scrapping the original titles. It was later re-released again on September 13, 1952, scrapping the first re-release's Blue Ribbon titles. The revised title sequences were edited right into the original negative, and thus, the original title sequences were cut away and possibly scrapped, although Tex Avery saved a few of his shorts' original titles being lost before they were cut. Though some have had their original bullet title sequences and credits restored for official DVD and Blu-ray releases, majority of the re-releases still feature the Blue Ribbon logo. In addition, most Blue Ribbon prints of the short, usually through the American and European 1995 Turner prints, can be seen on television packages throughout the world. Some of them, like "A Wild Hare", have edited lines, although the original unedited version is present on The Golden Age of Looney Tunes, Volume 4, Side 1, the Warner Bros. Home Entertainment Academy Awards Animation Collection, The Essential Bugs Bunny, and the Looney Tunes Platinum Collection: Volume 2, Disc 1. Also, several Blue Ribbon prints have altered titles. For example, "A Wild Hare"'s re-release print is also titled "The Wild Hare", "My Little Buckaroo" is titled "My Little Buckeroo", and "The Fella with the Fiddle" is titled "The Fella with a Fiddle". In addition to "A Feud There Was", instead of re-releasing other shorts into the Blue Ribbon program, seven other Blue Ribbon shorts have been re-released twice, scrapping the first re-release titles. They are, "The Cat Came Back" (1944 and 1954), "Of Fox and Hounds", (1944 and 1954), "The Fighting 69½th" (1943 and 1953), "The Early Worm Gets the Bird" (1943 and 1952), "Rhapsody in Rivets" (1947 and 1954), "The Trial of Mr. Wolf" (1946 and 1954), and "Old Glory" (1945 and 1953). However, the latter three were credited Warner Bros. on their first re-release, keeping the first Blue Ribbon re-release closing titles for the second re-release. Starting with the 1947-48 animation season reissues, custom fonts for titles were used. "Dangerous Dan McFoo" was the first cartoon to use this. The determining of cutting the credits to keeping them would determine which cartoons' copyrights were sold to Associated Artists Productions in 1956, though five cartoons that would remain in Warner Bros.' television packages were re-released under the original 1943 rules and one cartoon that was re-released in the 1952-53 animation season kept its original credits, but still replaced the opening and closing bullet titles. Later cartoons originally released from August 1948 to 1957 kept the original credits, to save Warner Bros. even more money. These were also edited into the original negative as the titles cut to the credits instead of faded in. Cartoons originally released between 1948 and 1951 and re-released in the 1956-59 animation seasons had their original closing titles kept, regardless if it was in the Merrie Melodies or Looney Tunes series. In the 1959-64 animation season, the closing titles were also replaced, except for a few (the ones originally released in the 1956-57 animation season). What's Opera, Doc? (1957), inducted in the 1992 list. "In this animation classic, Elmer Fudd's pursuit of Bugs Bunny is set to opera music and plays out on a Wagnerian scale. The film features such now-classic lines as "Kill the wabbit!" and is one of only three cartoons in which Elmer Fudd bests his rival Bugs. Directed by renowned animator Chuck Jones and his team at Warner Bros., this seven-minute short film is often considered to be Jones' cinematic masterpiece. It also holds the distinction of being the first cartoon selected for inclusion on the National Film Registry." Duck Amuck (1953), inducted in the 1999 list. The description reads: "One of the defining examples of Chuck Jones' irreverent creativity, "Duck Amuck" (a Warner Bros. "Merrie Melodies" animation) stars Daffy Duck, as brought to life by master voice artist Mel Blanc. Jones' gives the audience a convincingly fleshed-out character with true personality, regardless of plot or setting. Daffy begins the film as a Musketeer before his animators get the best of him by forgetting to draw in his backgrounds or supply him his voice. Extraordinarily self-reflexive, "Duck Amuck" does more than pierce film's fourth wall, it demolishes it, full send Daffy on a series of surreal misadventures." One Froggy Evening (1955), inducted in the 2003 list. The description reads: "A cartoon on every short list of the greatest animation, this classic Chuck Jones creation features crooning amphibian Michigan J. Frog, who drives his owner insane by singing only in private, but never in public." ^ a b "1947 academy awards". Infoplease.com. Retrieved June 26, 2013. ^ a b "1955 academy awards". Infoplease.com. Retrieved June 26, 2013. ^ a b "1957 academy awards". Infoplease.com. Retrieved June 26, 2013. ^ a b c d "National Film Registry List". The Library of Congress. Retrieved March 19, 2018. ^ Rich Sands (September 24, 2013). "TV Guide Magazine's 60 Greatest Cartoons of All Time". TVGuide.com. ^ Gabler, Neal. Walt Disney: The Triumph of the American Imagination. p. 181. ^ "Warner Bros. Titles". Retrieved December 5, 2018. ^ a b c "Brief Descriptions and Expanded Essays of National Film Registry Titles - Film Registry - National Film Preservation Board - Programs at the Library of Congress - Library of Congress". Library of Congress, Washington, D.C. 20540 USA. Retrieved January 5, 2019. ^ "1940 academy awards". Infoplease.com. Retrieved September 20, 2007. ^ "1941 academy awards". Infoplease.com. Retrieved February 10, 2013. Wikimedia Commons has media related to Merrie Melodies.